"It is the beast that chants a prayer. I'll unleash you, sacred wolf. Let the universe sympathize with your howling." 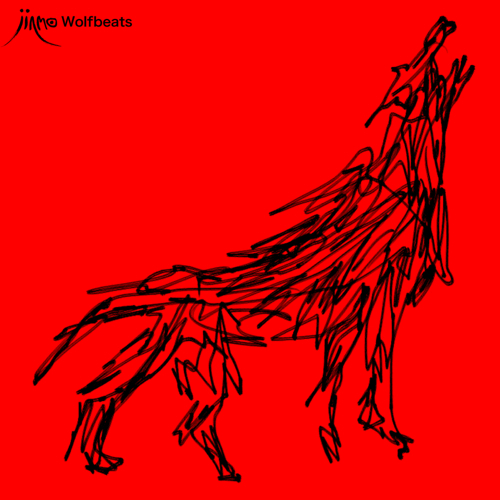 "Wolfbeats", the beats of wolf. JINMO manias already know that "wolf" is the symbol of his own for a long time and JINMO has frequently referred to that in his diary (Twitter) . It might be strange that he had not used the "wolf" as theme until his 110th album. Time has come, therefore this would be the "long-awaited" release for all JINMO manias. The wolves have been worshipped as sacred animals by Native Americans, Inuits or the Ainus since ancient times. This album "Wolfbeats" would be none other than a chant for the ceremonies. Thick, heavy "heartbeat" of the wolf that howling through the earth. And just like resonating with the universe, non-musical sound and feedback of "howling" with tactile impression like flesh and blood, filling all the audible range, like emitting the light to the outside moreover. Beautiful and powerful chant for the sacred animals connecting the heavens and the earth. Drawing on the cover is newly drawn "wolf spirit figure" by JINMO, it is forceful picture that drawn at a breath in about 10 seconds without underdrawing.